Appam is God’s own country’s revered food and most popular among Kerala breakfast recipes that are healthy and easy to make. These white lacy pancakes have a crisp side with an airy, soft on touch, fluffy center. 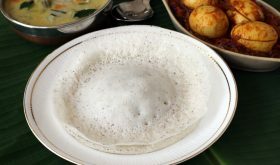 Appam recipe uses minimal ingredients, simple to make and usually served with a range of sides like vegetable stew or chicken stew, sweetened coconut milk, Kerala egg cury, egg roast, korma, chutney and kadala curry. Traditional appam preparation calls for the use of toddy aka kallu for the frementation of the appam batter. 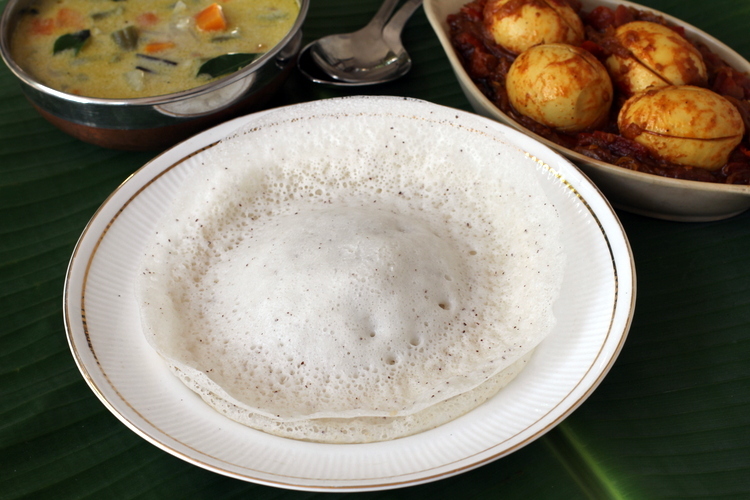 The alternate methods for fermenting appam batter are yeast or cooked appam batter in place of toddy. I have prepared appam recipe with both yeast as well as cooked appam batter and I prefer the latter in terms of flavor. 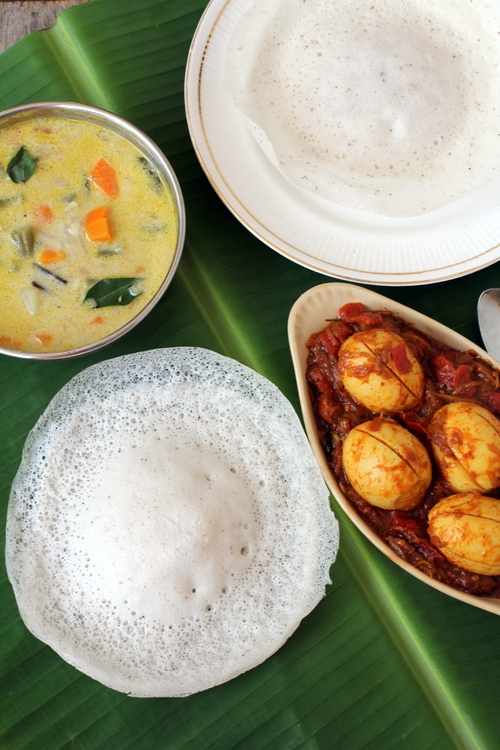 I served Appam with Kerala style vegetable stew and egg roast, the recipes of which I will post tomorrow. Drain the rice and grind it along with grated coconut and cooked rice in a mixer grinder. Add water little by little while grinding. You can add upto 3/4 cup of water. The ground batter need not be too smooth. When you run the batter between your fingers, it can feel a little coarse but not too coarse. Even if the batter is super smooth, its fine. In a stainless steel vessel, add 1/4 cup of the ground batter and 3/4 cup of water. Place it over very low flame and go on stirring constantly. It will begin to thicken, continue stirring vigourosly till it appears like a transparent thick mixture. Turn off heat and bring to room temperature. Add the cooled cooked batter to the remaining ground appam batter and mix well such that there are no lumps. Add 1/4 to 1/2 cup water, if necessary. This batter should not be too runny like rava dosa batter not thick like a masala dosa batter. It should be a slightly thick pouring consistency. Place lid and ferment this batter overnight. It will almost double in size on fermentation. At the time of preparation, add salt, sugar and baking soda. Mix well but do not over beat the batter. Heat the non-stick appam pan on medium flame for 2 mts. There is no need to add oil while preparing appams. Add 2 to 3 drops and use a tissue to grease the pan all over. Lower flame, pour a ladle full of batter or a little more than 1/4 cup of batter in the center of the pan. Lift the pan (off the flame of the stove) and twirl the batter in a clock wise direction so that the batter spreads out in a circular shape. Do not twirl more than twice. There will be more batter in the center than the sides, which is fine. Place back the pan on stove, cover with lid and cook on low flame. Check after two mts and if it is done, remove from pan, otherwise continue to cook with lid for a little while longer. It should cook within 2 1/2 mts to 3 mts. The edges will be crisp and will slowly leave the sides of the pan. Use a flat spatula to lift the appam off the pan and place on serving plate. You can cook for a while longer for browner edges but I prefer pure white appams. Prepare appams with the rest of the batter. There is no need to add oil for preparing appams in a non stick pan. Serve warm appams with vegetable or chicken stew, egg roast or sweetened coconut milk. Left over fermented batter can be refrigerated upto 2 days and not beyond that as it has coconut. If using toddy, add 1 cup toddy instead of water. If using active dry yeast instead of cooked appam batter, add 1 tsp yeast to 1/4 cup of luke warm water and 2 tsps sugar. Leave aside for 15 mts and the yeast will dissolve, froth and double in size. Add this to the ground appam batter and mix well. Place lid and let it ferment overnight in a warm place. Next add morning, add salt to the fermented batter, mix and prepare appams. There is no need to flip the appam to cook the other side. Left over batter that has been refrigerated and used on the second day can be sligthly diluted with very little water. By Sailu Published: June 10, 2013 Appam recipe is made with rice and fresh coconut with or without yeast.Its popular among Kerala breakfast recipes that are healthy, simple and easy to make. 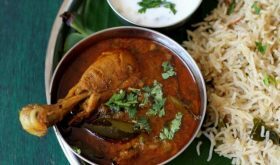 can i prepare this with basmati rice? Appam is not from God’s own country. “The Story of our Food”, a book written by K. T. Achaya, an eminent Indian food scientist and food historian, states that foods like Appam, Idiyappam, Dosai and Adai were already known in ancient Tamil country around 1st century AD, as per references in Tamil Sangam literature. that is say Kerala is originally a part of Tamil… because we all know there malayalam is inluenced by tamil and sanskrit.. and Appam is tradionally more Nasrani touch to it… now with globalization appams are cooked by all.. but it were not and is not.. mostly nasrani’s make them. Malayalam is not just “influenced” by Tamil.Malayalam like all the other 3 South Indian languages are DERIVED from Tamil. That’s why the similarities. Appam is a common dish all over Tamil Nadu. Looks like you and sumitra came from the forum mayyum hub from 2004. Too much of bragging about Tamil. 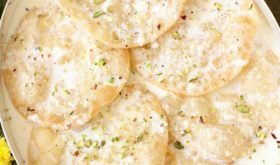 KT acharya book is just one that you mention – likewise there is also another book which says something else about the origin of some foods you mention. Oh please stop it. NOPE not all south Indian languages are derived from Tamil. Tamilians like to believe that they are the origin of everything. Just too sick and tired of it. 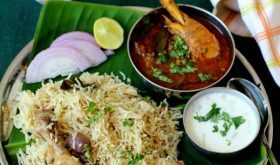 This blog is very good without your tamil bragging- dont spoil the spirit of cooking and food with your make believe tamil origins like some people did in the forum mayyum hub back then. Just because you don’t like Tamilians,you start bickering about anybody who mention the facts?? If you have a point to make,do share it..
Appam of what kind shown in the making is a pure Kerala dish and it is mostly associated with Jewish and Christian history of Kerala. 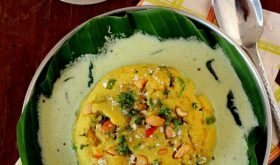 Tamil Nadu may have some food recipes similar to appam since the staple food is rice in these areas but surely not this appam, because the making is very different and is also associated with the religious ‘passover’ feast of Jews and Christians. do you know how to make a vegan pav bhaji?? I have not tried my hand at Appam before but with this recipe, I will. I am impressed by the very well written instructions. I find nothing more frustrating than trying to decipher half-baked (pun not intended) cooking instructions. I’m a frequent visitor to ur site,i thoroughly enjoy making your recipes.I have one question ,can we make appam on a normal dosa pan. I’m afraid a normal dosa pan will not work for appam. Appam pan is best. Am afraid desiccated coconut will not work. Use fresh coconut only. This method of prepartion is diff for me .We wont do steps 2-3 .WE grind the flour and ferment it.Happy to know a diff preparation of same recipe. For appam you have grated coconut as an ingredient, can i use the store bought greated coconut of should i used fresh grated coconut? Thanks for the recipe, the appams turned out very well. 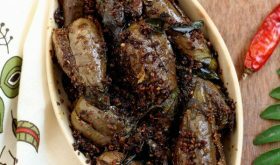 Thanx for u such wonderful recipe…..
Hi Sailu, I have a question. Can these be made an hour ahead and kept warm in a hot case? I was planning to make it for a dinner party. Might be hard to make them right away. Please let me know. Excellent appams, made the yeast version 3 times so far- loved it. 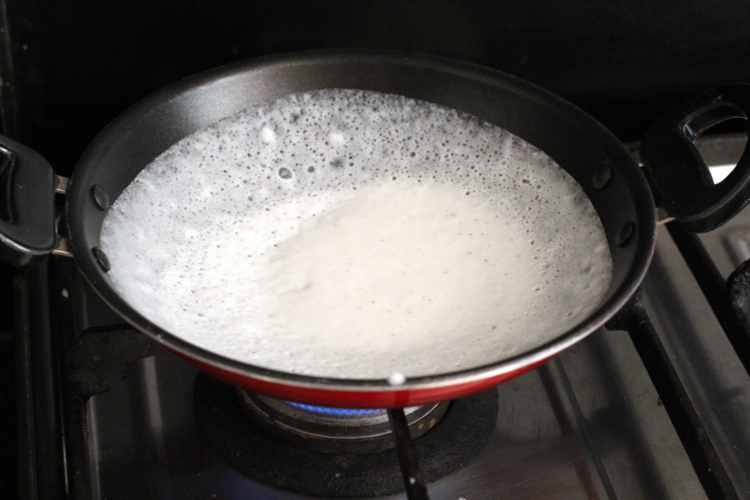 Appam of what kind shown in the making is a pure Kerala dish.